10 Things You Might Not Know About THE 1960s DALEK MOVIES | Warped Factor - Words in the Key of Geek. Geek Dave is not canon. 1. Released in August 1965 Dr. Who & the Daleks was the first of two films made by Amicus Productions based on the Doctor Who television series. Amicus had bought an option to make this story, an adaptation of the second broadcast Doctor Who television adventure, plus two at the time unnamed sequels, from Terry Nation and the BBC for a combined licensing fee of just £500! 2. A number of changes were made to the main characters in the process of transferring Doctor Who to the big screen. Most importantly, The Doctor is shown to be a human scientist named Dr. Who, rather than an alien time-traveler, specifically a Time Lord from the planet Gallifrey, whose name is never revealed, and who is referred to simply as "The Doctor". Dr Who had not stolen his TARDIS and fled his home planet, rather he was an eccentric inventor, and TARDIS (no "the") is his latest gadget. Other notable changes include Dr. Who having two grandchildren - Susan and Barbara, whereas in the TV series only Susan is related to the Doctor. In the film Ian is Barbara's boyfriend, whereas in the TV series they were teachers, working at the same school. 3. William Hartnell was never considered to play the role of Dr. Who in the films, primarily because Amicus wanted someone who was better know internationally and, specifically, in the US. Peter Cushing was chosen to play the character, and some years later in an interview he provided a theory as to how his human incarnation of the Doctor could indeed be canon, and that his film version of the Doctor and the television Doctor were bridged together by the Celestial Toymaker. His theory was that his Doctor is a future incarnation kidnapped by the Toymaker, who "wiped his memory and made him relive some of his earlier adventures." Chameleon Arch fob watch, anyone? 4. As this would be the first time the Daleks were seen in colour, and indeed any element of Doctor Who, they were redesigned for the film. They had larger base sections, which made them taller and more imposing than the TV Daleks, which were only about five feet high. They had distinctive red dome lights and some were fitted with a two-jawed mechanical claw instead of a plunger. They also had more colourful paint schemes. Standard Daleks had blue domes, skirt balls and fenders, and gold collars. A Dalek leader was painted predominantly black and a second-in-command in red. 5. Originally the Daleks were going to be armed with flamethrowers, but these were vetoed on health and safety grounds and because they were considered too frightening for a young audience. Instead the guns produced jets of CO2 gas from internally mounted fire extinguishers. 6. Whereas the TV series had a very limited budget, often resulting in less than a handful of Dalek props appearing in any one serial, the film had a whopping (!) £180,000 budget. That might seem quite a lot for a mid-1960s picture but when you consider that Mary Poppins, which was released the same month, had a budget of $4 million it kid of puts that figure in perspective. It still meant that many more Dalek props could be produced, although not all of them were 'working models. Some of the Daleks used in the background for crowd scenes were constructed from nothing but moulded fibreglass, and can be distinguished by the slightly different shape of the collars around their midsections. 7. After filming was complete on Dr. Who & The Daleks three of the movie Dalek models were hired by the BBC and used in the serial The Chase. The Chase was broadcast from 22nd May 1965, so as the film was not released until three months after that, the film actually marks those movie Daleks' second appearance. 8. 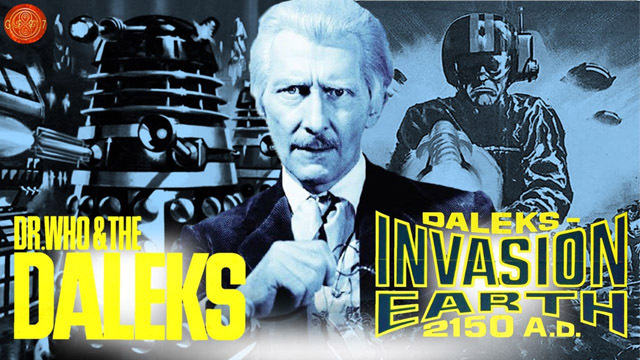 The second Amicus film, Daleks - Invasion Earth 2150 A.D., which was based on the television serial The Dalek Invasion of Earth, featured a early product placement deal, something which is completely commonplace today, but no so much back in 1966. The breakfast cereal Sugar Puffs sponsored the film. 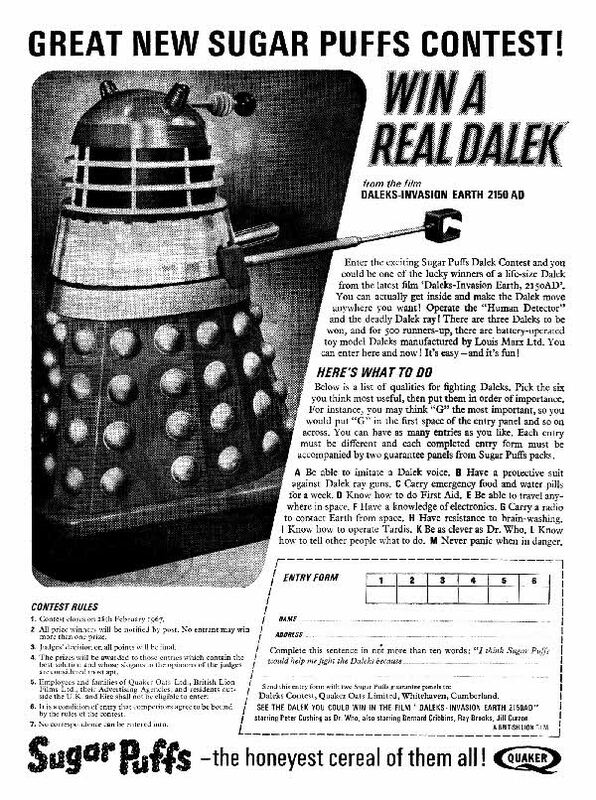 In exchange for its funding, the company was allowed to run a special competition on its cereal packets (with a Dalek prop as the prize) and feature the Daleks in its television advertisements. Sugar Puffs signs and products can also be seen at certain points in the film. In DWM 469, Steven Moffat stated that he wrote a scene for the fiftieth anniversary special The Day of the Doctor in which Kate Stewart would walk past posters for the Peter Cushing films while noting the "need to screen the Doctor's known associates." Moffat explained that he believed the films existed in the DWU as "distorted accounts" of the Doctor's adventures (*cough* Chameleon Arch *cough*). However, the scene was never shot as the production team could not afford the rights to the posters! 10. A third Dalek film, to be based on the serial The Chase was planned but never produced because of the second film's under-performance at the box office. However, Peter Cushing would play Dr Who one more time. During the late 1960s there were plans for a radio series starring Boris Carloff as the voice of Dr. Who. When Carloff became unavailable Cushing stepped back in to voice the part. A collaboration between Stanmark Productions and Watermill Productions, a pilot was recorded with Cushing and a further 52 episodes were to be produced. The pilot story (titled Journey into Time) featured Dr. Who and his granddaughter travelling to the time of the American Revolution. The script was written by future Doctor Who TV series writer Malcolm Hulke. The pilot was not commissioned to series and, sadly, the recording was subsequently lost!